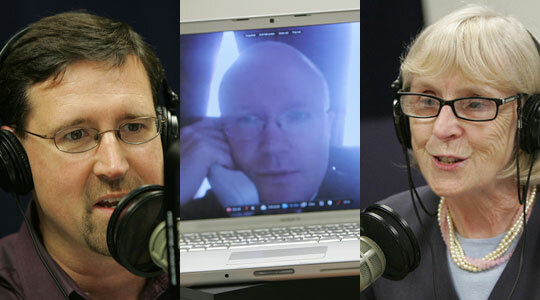 Summary of today’s show: Scot and Susan discuss the news of the week with Greg and Fr. Roger including the dispute between Fr. Frank Pavone of Priests for Life and his bishop; the US bishops mobilizing Catholics against violation of conscience in healthcare legislation; Fr. Roger’s editorial on protecting priests from false accusations; and women religious in Boston celebrating jubilees and over 5,000 years of combined service to the Church. 1st segment: Scot caught up with Susan this Thursday. She’s off and running with the new school year and so has religious education. This Sunday is Catechetical Sunday and most parishes will begin their programs on Sunday. Parish catechists are frontline apostles, as John Paul II called them. Scot said every parish needs more catechists and listeners should consider helping out. 2nd segment: Scot and Susan welcome Greg and Fr. Roger. Scot said the centerfold in this week’s Pilot is about religious sisters who are celebrating their jubilee anniversaries. Greg said it’s a joyous celebration to celebrate their 25th, 50th, 60th, and even 75th anniversaries of religious life. All combined all these women have given more than 5,000 years of service! The Mass took place at St. Theresa of Avila in West Roxbury, which is Susan’s parish. She said it’s a wonderful celebration. The oldest jubilarian was Sister Declan Sullivan, 93, at 75 years of service and she said it was one of the most beautiful celebrations she’s had. Bishop Dooher celebrated the Mass and praised the sisters for their service and witness. He also connected the celebration to the commemoration of 9/11 which occurred on the same day. Sister Sean Mayer of the Daughters of St. Paul was the youngest at 45 with 25 years of service. She entered the order at 14 and professed at 20. Fr. Roger said in an age where so few make commitments and where those who do don’t keep their word, these women who’ve kept these commitments are a sign of fidelity and what God is saying to us through them about the great mystery of their vocation and God’s great faithfulness to them. It is a sign that God calls each of us in our own way and their vocations are signs to us of our own eternal vocation to be with God in heaven. The Pilot article on Friday will have a complete list of the names of the jubilarians. 3rd segment: The US bishops are asking all Catholics to mobilize to contact Congress and the Dept of Health and human Services to guard our consciences on issues of contraception. Greg said the new healthcare reform law pushed by the Obama administration, health care plans must cover the abortifacient morning-after pill and contraceptives. While there is a conscience protection clause in the regulations, it is so narrowly written that Catholic hospitals, schools, and charities would be required to pay for these drugs and sterilizations. There is a public comment period for these regulations that expires at the end of this month. The bishops are urging people to register their objections at http://www.usccb.org/conscience. Susan said we have a moral obligation to act and to let our elected officials know how we feel about this. She noted that antibiotics aren’t being made free or children’s vitamins, but these morally objectionable drugs and services are. Scot said parish bulletin announcements have been sent to parishes. Greg said that if these rules get passed, church organizations may be forced to stop offering health care benefits to employees and their families. Fr. Roger said as Christians we have to vote. He said not to worry about exactly how you word your objection because they’re just adding up Yeas and Nays. Congress is also considering a Respect for Conscience Act that would require all federal agencies to include respect for conscience in their actions and regulations. 4th segment: Scot said on the front page of the Anchor this week is a story about the incardination of Fr. Andrew Johnson, a religious order priest who is becoming a diocesan priest. Fr. Roger said incardination means you belong to a diocese or religious institute or congregation. When Fr. Johnson, he was ordained into the Cistercian Order. Fr. Roger was incardinated as a priest of Fall River. Incardination is a process of moving between dioceses or between a diocese and religious order. Fr. Johnson, with the permission of his religious order, has discerned becoming a parish priest of Fall River. He is currently serving as a hospital chaplain. Scot and Susan recalled that in 2009 Fr. Ken Cannon was incardinated in the Archdiocese of Boston at a Mass at the Pastoral Center as Cardinal Seán recounted in his blog on May 15, 2009. Related to incardinations, Fr. Frank Pavone is a priest of the Diocese of Amarillo, Texas, but was originally was a priest of the Archdiocese of New York. He moved to Texas at the invitation of the previous bishop to start a pro-life priests’ group, but now the current bishop, Bishop Zurek, has asked Fr. Pavone to leave Priests for Life and return to the diocese. Bishop Zurek’s letter was strongly worded and accused Fr. Pavone of having an inflated ego and questioning the finances of Priests for Life. Greg said he was unaware of having seen any other public letter that was this strongly worded. He said it recalls the recent situation regarding Fr. Corapi. He did not the statement correctly saying that there cannot be a freelance priest. A priest must answer to a bishop or a religious order. He believes Bishop Zurek is trying to reassert his authority over a priest who has become a freelancer. Scot said Fr. Pavone’s response letter was respectful and responded to many of the issues raised in the bishops’ letter. Fr. Pavone has been focused on providing priestly leadership throughout his priesthood at the urging of bishops like Cardinal John O’Connor of New York. Among Bishop Zurek’s points was that Priests for Life raises $10 million per year without oversight. Fr. Pavone countered that a board of bishops oversees the organization. Fr. Roger said it’s terrible is being played out in public. He doesn’t think there is a more articulate pro-life advocate in the US and he is able to write credible and original weekly columns on this issue throughout the year. Fr. Pavone moved to Amarillo to found a religious order of pro-life priests, but that didn’t happen for various reasons. So he is still a parish priest under obedience to his bishop. Fr. Roger said it’s very unfortunate to have this compared to other celebrity priests who’ve had scandals because even Bishop Zurek’s letter doesn’t allege actual wrongdoing on the part of Fr. Pavone. Fr. Roger pointed out that the Bishop does have a right to ensure that Fr. Pavone is on the up and up with regard to his personal finances because he has a duty to shepherd his soul. The bishop may have gone overboard in his language, but Fr. Pavone has to remember that he is a priest of the diocese. Fr. Roger guesses that Fr. Pavone will eventually incardinate somewhere else under a bishop who will respect his desire to engage in pro-life ministry full-time. Susan said the bishop’s letter was very harshly worded. As is often the cause, the real loser in this is the Church’s work for the unborn. She said the CNS story says Fr. Pavone doesn’t get a salary but that Priests for Life pay for his housing expenses (about $2,000 per month) and his expenses in working for Priests for Life. Scot said some people are trying to tie this to the Corapi situation of a couple of months ago, but there is nothing to compare this with that case or of the previous case of Fr. Tom Euteneuer of Human Life International. 5th segment: Scot encouraged listeners to remember the CatholicTV telethon is coming up and asked them to tune in. Fr. Roger write an editorial in this week’s Anchor about a priest in Niagara Falls who was extorted by a drug addict who demanded money in exchange for not filing a false accusation of abuse. Fr. Roger said the priest eventually gave him all his savings, maxed out his credit, borrowed from friends, and even took money from the parish to pay off this man. It came to $90,000. Fr. Roger asked why a priest would feel so vulnerable to a false accusation from a drug addict with so many credibility problems. The answer is that any accusation, no matter how outlandish, sets in motion a series of protocols that aren’t actually in the letter of Church policy but that treat any accusation as credible. At the moment of an accusation, a priest has to leave his ministry, move out of the rectory, stop wearing his clerical clothes, and endure a press release about it. He said in many ways the same injustices that occurred prior to 2002 are now being foisted on priests. In both cases, it wasn’t the policies but a lack of adherence to policies in place. Another point is that it takes so long for these investigations and trials to occur in the Church that it leaves priests in limbo and sometimes they never resume their priestly ministry. Susan asked how long it takes to decide if an accusation is credible. We need to balance protection of the innocent victim of abuse with the protection of the innocent victim of false accusation. How can we speed up the process so these men won’t have their reputations and priestly ministries suspended. Scot said some priests say two wrongs don’t make a right. Greg agreed that the process drags slowly even though some cases are immediately not credible. On the other hand, he is torn. He started working at the Pilot just as the scandal in Boston broke and he saw how the trust of the people was broken. It’s a very difficult call to make. Fr. Roger has some ideas how to defend the full rights of accusers and the accused, to remove guilty priests as fast as possible and return innocent priests. First, there needs to be a real preliminary investigation when an accusation comes in by someone who is competent and trained to determine whether it is a truly credible and plausible accusation. Many times priests are just told they’ve been accused and not given the details of what he’s accused of. Second, a priest who maintains his innocence should be entitled to a speedy investigation by both civil authorities and ecclesiastical review board. There’s no excuse for a priest accused in 2002 to not have an answer to his circumstance today. We need to have the same outrage for false accusations of innocent priests who are hung out to dry just as we had for the abuse of children and the lack of response by the Church. Third, everything must be done to protect the reputation of a priest who has been accused but not convicted or admitted guilt. Scot said he hears similar comments from priests all the time. He said priests recognize that the pendulum needed to swing back to protection of children, but it’s swung too far.